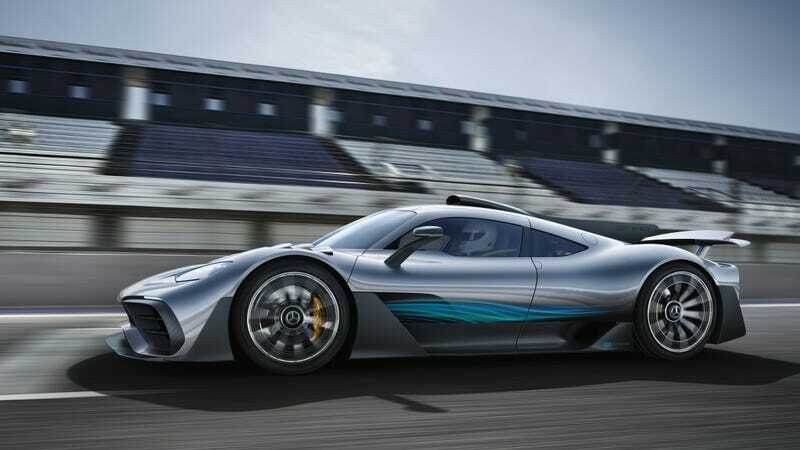 The Mercedes-AMG Project One, an angry fish-looking thing, will be the German automaker’s street-legal Formula One car. With a price of nearly $3 million, it seems like Mercedes is also going the way of Ford and Aston Martin by reportedly forbidding buyers from flipping their cars as soon as they get them. Violation threatens a lawsuit. Mercedes is following a similar path with its prestigious project Project One, which will be handed over to its first customers in early 2019. It’s unclear exactly how long Mercedes will demand that its customers hold onto their cars before selling them. We’ve reached out to Mercedes for confirmation and clarification on the matter and will update if we hear back. Ford is the most prominent automaker in recent memory to enforce such a policy with the new GT, demanding that its customers keep their cars for at least two years before selling them. Ford famously sued (and settled with) John Cena when he broke contract early and sold his. Aston Martin has a similar policy for its own road-going F1 car, the Valkyrie. I guess I understand with the Ford GT. Flipping that car could legitimately keep it out of the hands of someone who truly wanted it (if they could afford a half a million dollar supercar, of course.) But I think Mercedes is being silly with the Project One. When you start pricing cars in the millions, people who can afford to drop that kind of cash on a vehicle won’t be nickle and diming it over a few extra million. Of course, prohibiting people from selling the car ensures that the automaker is the only one who gets to sell it. It’s also a monopoly on the money that these cars can fetch.